Without doubt Boeing Flying Fortress B-17F 41-42285 Memphis Belle and her crew generate an image that is an all-American icon. Indeed, it has been claimed that the Memphis Belle is in the top five of the most famous American aircraft of all time. 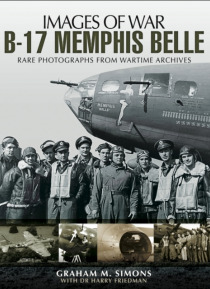 In September, 1942, a new Flying Fortress was delivered at Bangor, Maine, to a crew of ten eager American lads headed by Robert K. Morgan, a lanky 24-yea… r-old USAAF pilot from Asheville, N. C. The boys climbed aboard, flew their ship to Memphis, Tenn. and christened her Memphis Belle in honor of Morgan's fiancee, Miss Margaret Polk of Memphis, and then headed across the Atlantic to join the US Eighth Air Force in England.Between November 7 1942 and May 17 1943 they flew the Memphis Belle over Hitler's Europe twenty-five times. They dropped more than 60 tons of bombs on targets in Germany, France and Belgium. They blasted the Focke-Wulf plant at Bremen, locks at St. Nazaire and Brest, docks and shipbuilding installations at Wilhelmshaven, railway yards at Rouen, submarine pens and power houses at Lorient, and airplane works at Antwerp. They shot down eight enemy fighters, probably got five others and damaged at least a dozen. Memphis Belle flew through all the flak that Hitler could send up to them. She slugged it out with Goering's Messerschmitts and Focke-Wulfs. She was riddled by machine gun and cannon fire. Once she returned to base with most of her tail shot away. German guns destroyed a wing and five engines. Her fuselage was shot to pieces but Memphis Belle kept going back.The Memphis Belle crew has been decorated 51 times. Each of the 10 has received the Distinguished Flying Cross, the Air Medal and three Oak Leaf Clusters. The 51st award was Sergeant Quinlan's Purple Heart.